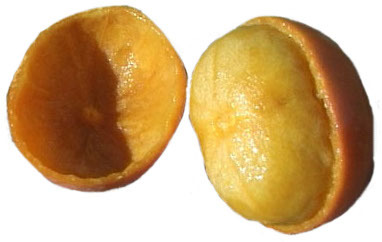 Garcinia. 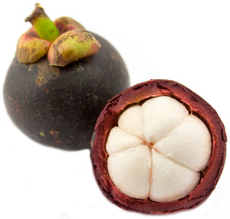 MANGOSTEEN. (For Laurent Garcin, MD (1683- 1751), French traveller in India, botanical author.) Guttiferae. Around 200 evergreen trees and shrubs to 15m. Leaves opposite, decussate, entire, coriaceous, deep green, petiolate. Flowers solitary or few, terminal or axillary, polygamous, sometimes apomictic, green, white, yellow or red; petals 4-5, overlapping, sepals 4-5, occasionally 2, valvate; stamens 8-many; staminodes may be present; ovary 2-12-locular; stamina lobed, flattened into subsessile disc. Fruit a leathery indehiscent berry; seeds large, surrounded by succulent arils. Tropical Asia, Polynesia, southern Africa. Garcinia xanthochymus, is an attractive low, broad tree often used as a dense screen for general landscape planting in the tropics. Garcinia mangostana, called ‘queen of fruits’ by the plant explorer Fairchild, is grown extensively in Indonesia and Malaysia but is difficult to establish outside its native zone; but this can be done if the right conditions are carefully arranged. It grows well in tropical rainforest close to the equator, with no dry season. Only female trees are known, but fruits are produced without fertilisation. It takes at least eight years before the tree starts bearing but yields of 200-1500 fruits per tree have been reported. Soils should be fertile heavy clays with good drainage. Propagate in summer by greenwood cuttings with bottom heat or under mist. Alternatively by budding on to seedlings. Grow plants on in individual pots as they will not tolerate their roots being disturbed. Give shade from bright sun while young and mulch/fertilise annually. Plant out when 60-75cm high. In temperate zones, grow in the hot glasshouse in a high-fertility loam-based medium with additional leafmould. For the purposes of clarity only edible fruit species are featured below. Tree to 7m. Leavs oblong, acuminate, 15cm or more, bright glossy green above, paler beneath. Flowers clustered, creamy-white; petals incurved so flowers appear globose. Fruit smooth, yellow, apple-sized; arils yellow, edible. Winter. Moluccas. Tree to 11m, columnar; smaller branches whorled. Leaves oblong to elliptic, obtuse, to 13cm, margins undulate, venation pinnate; petiole short. Flowers axillary, solitary or 2-5 in clusters, pale green, white or pale yellow, vanilla-scented, 7mm; petals 5; sepals 4; staminodes free, 2-ranked. Fruit globose, orange-yellow to red, 2.5cm diameter, edible. Tropical southern Africa. MANGOSTEEN. Tree to 10m, columnar. Branches many, decussate. Leaves elliptic, acuminate, 25 x 10cm, coriaceous, dark green; lateral veins many, parallel. Flowers solitary or paired, rose-pink to yellow, 5-6cm across; petals 4, round. Fruit large, deep purple-black, 7.5cm diameter, pericarp thick; seeds 5-7, large, surrounded by white aril. Malesia.